A small, sturdy spacecraft known as Galileo will plunge into Jupiter's atmosphere this Sunday at about 4 p.m. EST, after eight surprisingly productive years of observing the giant gassy planet and its moons. NASA scheduled the destruction to ensure that the spacecraft will not crash into Jupiter's ice-covered moon Europa. Ironically, Galileo's own observations discovered the deep ocean under Europa's ice, where any surviving hitchhiker microbes might be able to take root, and so the observer sealed its own fate. The Galileo mission had a rocky start. Scheduled to launch in 1983, the 2.5-ton object was not ready to go until 1986. Then the loss of the Challenger delayed the project because of enhanced safety protocols. When the mission finally got underway, it took a clever "slingshot" maneuver to send the spacecraft around Venus, back to Earth, and then caroming off on a trajectory to Jupiter. Though the device finally reached Jupiter on Dec. 7, 1995, its large antenna, built to direct data streaming back to Earth, failed to unfold. Galileo was millions of kilometers away, lacking its main communicating device, and saddled with computer equipment that had been state-of-the-art in the 1980s. 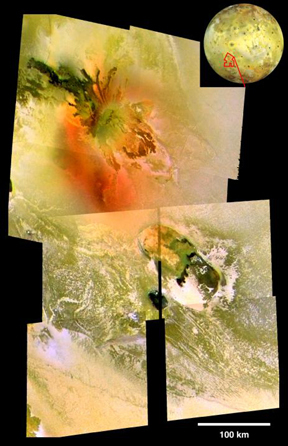 The Culann Patera volcano (top center) on Io lies just north of an "enigmatic mountain" called Tohil Mons, seen here in mosaicked high-resolution Galileo images from three flybys: November 1999, February 2000 and the July 1999. Planetary geologists have puzzled out geologic relationships from these data. It's amazing what a successful mission it's been despite its handicaps." Rosaly Lopes-Gautier, a volcanologist at the Jet Propulsion Lab at Caltech, who specializes in Io's volcanoes, estimates that Galileo sent only about 30 gigabytes of information back to Earth, but it was all tantalizing bits of data about Jupiter and its moons. By recording extraordinarily high and unexpected temperatures on Io, Galileo showed that the volcanism there was hotter and the volcanoes more numerous than the previous Voyager mission could detect, a decade or so before Galileo. "Io has lavas that are much hotter than anything on Earth today," Lopes-Gautier says, and they seem to be similar to ultramafic komatiite lavas on earth. "It's like looking at Earth's eruptions a couple billion years ago." The planetary geologists directing each device selected their images and data collection very carefully, using such instruments as a near-infrared mapping spectrometer, magnetometer, plasma wave subsystem and heavy ion counter. The spacecraft and its various devices were programmed to shut down to protect the elements from exposure to radiation and high temperatures. Engineers and software designers had to juggle software code to direct Galileo from afar, but they managed to upgrade the systems onboard and on Earth to enhance the spacecraft's capabilities. After its first six-year mission was complete, NASA extended Galileo for two years in 1997, and then twice again. "It was a much more resilient spacecraft than anyone thought," Lopes-Gautier says. "We only planned to do one close flyby by Io  one day would give you 4,000 times the lethal dose of radiation, which is not very good for a spacecraft or electronics." Galileo was exposed to four times the amount of radiation it was meant to be exposed to, said Colleen Hartman, director of the solar system exploration division of NASA, at a press conference in Washington, D.C., on Wednesday. "This was a huge human achievement," Hartman said. She estimated that more than 800 people, not including consultants, had worked on the project over 30 years of the mission, from its inception to today. "When this mission started, I still had hair," joked Michael Bolton, team leader for the Galileo Solid State Imaging Team. "Those of us still here are enjoying the fruits of our labor," he said, making sober reference to those scientists who died before the mission was complete. Even before the Galileo mission ends, however, scientists are beginning to plan the next Jupiter observing mission, called the Jupiter Icy Moons Orbiter, or JIMO. Hartman noted it will be NASA's first nuclear-powered mission, though it will not launch until about 10 years from now. "[It will] not get to Europa until almost 20 years from now," Pappalardo says. "If it stays on schedule, it would get there before I retire," which will make it another intergenerational project, much like Galileo was. When its last mission ends this Sunday, Galileo will take one more look at the debris in the path of the moon Amalthea, and then head for Jupiter's atmosphere. The friction of its entry will disintegrate the spacecraft, long before it penetrates Jupiter's lower atmosphere. But the instruments will continue to listen and stream data back until they are vaporized, almost 3 billion miles after its launch many moons ago.